Most likely, all methods are acceptable, only if done the right way. Some manufacturers of bed comforters provide very strict instructions which insist down comforters ought not to be washed but dry cleaned in washing machines, so it’s vital to check care tags and labels before placing the down comforter in any washing machine. Some contend that it is too easy to well dry clean the down comforter improperly, removing the essential oils from the goose down. Probably the best route is to make use of a professional comforters cleaner one who is experienced in cleaning or laundering bigger comforters or down comforters. They’re listed on the internet and in phone directories. If there are no local cleaners who can handle comforters, you can mail it out so as to be cleaned. Your down comforter could be dry cleaned; however laundering with clean water as well as gentle cleaning solutions particularly formulated for down comforters is preferred. This type of mild cleaning solutions can be found where camping supplies and equipment are sold. One retailer of down comforters recommends cleaning them every once in five years, however only if very necessary. Frequent and improper washing could damage the clusters, they point straight out, stripping each of their natural oils or causing breakage in them. Washing can also lead to shrinking of comforter to about 3% to 5%. Others may say this is very hooey, that a comforter will absorb oils and sweat off of one’s body. Body oils and sweat are what make comforters down flat and finally ruin it. That is why your comforter gets too flat or dirty up close to the top — it is from natural body oils on ones face and hands thus should be washed more often enough to get rid of the oils before they produce some unpleasant odors and smells. They advocate washing or laundering with mild cleaning solutions. On the other hand, if one purchases or make covers for the comforters by sewing together a number of sheets, this could keep oils and dirt from penetrating beyond these covers, which can be easily and frequently washed. At Home or in a Laundromat? Some people have few or no problems, or so they say, in utilizing their very own washing machines washing comforters while some other say washing their comforters at home could damage both the washer or dryer and the comforter. This machine is not designed to handle very bulky items which get heavy when soaked. It’s safest to use the front loading commercial washers. 1. Check for tears, rips and openings in the seams. Weak or ripped parts must be mended before washing, otherwise, the ripped or weakened areas can become even worse, and you’ll lose down filling. Mend rips with any fine needle and a color matching thread. Make sure to close open seams by use of simple slip stitches. 2. Spot-treat all stains before you washing. 3. Set the washing machines on delicate or on warm water setting. 4. Allow the washing machines to agitate for some minutes. After the mild detergent and water are thoroughly mixed, put the down comforter very loosely into a washing machine. 5. Place a pair of very clean white tennis shoes, with all laces removed, into a washing machine to aid keep the comforter evenly distributed; they’ll also help in this washing process. 6. If ones washing machine has extra rinse setting, then turn that to the on position; and if not, simply ensure to rinse one more round before the eventual spin. 7. If you do not want to risk any damage to your washing machine, start pulling the down comforter out and very gentling squeezing any water out. Once you have removed much of the water, one may try to spin drying. 8. Be certain to dry this article very thoroughly to ensure it would not mildew. Mildew could ruin any down comforter, so ensure it’s completely dry enough before storing. Do not store it in plastics. Instead, wrap it in some cotton so it can breathe adequately. Store the comforters in dry and well-ventilated closets or rooms when you are not using them, so as to avoid mildew. Be very sure never put it well away for almost a month after cleaning, this could still be dampen the inside and mildew. If your comforter is not excessively dirty, one may want to consider home dry cleaning kits for dry cleaning their down comforters. 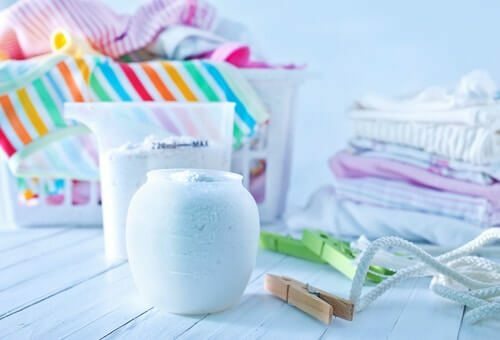 These home dry washing products work in any dryer, and they’re said to provide very satisfactory results as compared to that of professional dry cleaners. To assure that one’s down comforters stays fluffy and nice for years and more years, it is a very good idea to avoid lying or sitting often on top of comforters. Down clusters are very strong, but if they’re repeatedly crushed they’ll eventually break, causing ones comforters to lose their ability to hold enough warmth. For more washing and laundry tips check our laundry blog. To check if your comforter needs dry cleaning here is a good resource.